Frozen yogurt is lower in fat content than ice cream. There are also non-fat and low-fat versions of frozen yogurt, which contain anywhere from 4 grams of fat to as little as zero grams of fat per serving. 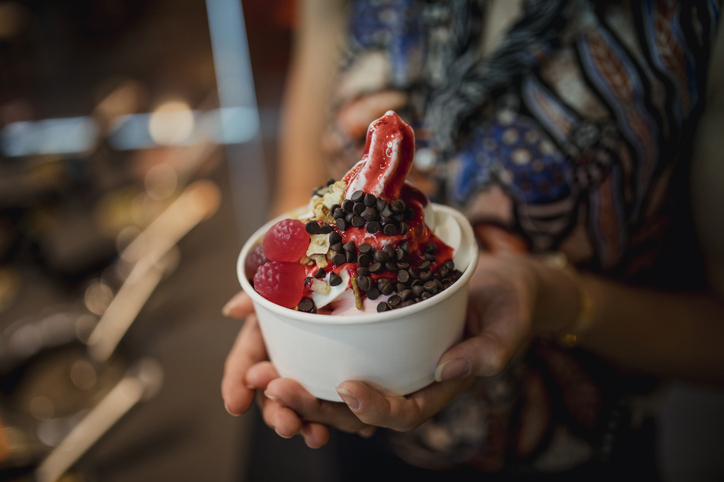 Additional benefits to choosing frozen yogurt over ice cream include the potential to reap benefits from probiotics found in yogurt, reduced sugar content and fewer calories per cup. Many people use the turning of a new year as an opportunity to change old habits. For those looking to start living a healthier lifestyle, having a delicious and healthy snack in Plano is definitely helpful. Fortunately, Pinkberry frozen yogurt in West Plano Village offers a wide range of delicious options. From traditional frozen yogurt to pineapple colada and everything in between, Pinkberry has options to fit every palate. There’s even a wide range of toppings from which to choose including fruit and your favorite kind of candy. They also offer a protein-packed smoothie made with original frozen yogurt blended with real fruit for those in need of a sweet treat on the go. Whether you’re looking for healthy snacks in Plano or a delicious option for dessert, Pinkberry has you covered. So, come on down, pick your favorite flavors and toppings and live a little. Want to learn more about healthy snacks in Plano? Visit the West Plano Village blog today!